Kepler Space Telescope launched by NASA in 2009 to find Earth-sized planets orbiting other sun-like stars has recently discovered a new planet orbiting the Kepler-90 star. This brings the number of planets around the star to eight, the same as the number of planets in our solar system. The star and the system in which the new planet is located is about 2,545 light years away from our planet. There could be more planets in the system which have not yet been spotted. The scientists register the light from the stars as planets pass in front of the stars. By analysing the speed and the characteristics of dimming as the planets move, the approximate view of the solar system is obtained. This involves pattern recognition which until now, was carried out by scientists. Machine learning algorithms which are trained to learn to recognize the patterns have made this process quick and effortless. 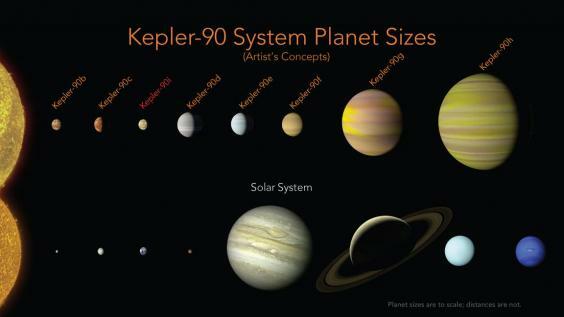 The use of artificial intelligence to sieve the massive amounts of data collected by Kepler is expected to be a game changer for scientists working on the understanding of planetary systems around other stars.